Rhizome | A Scanner, Darkly: On Andrea Crespo's "polymorphoses"
Anton Haugen | Wed Aug 26th, 2015 10:15 a.m. In futurist Ray Kurzweil's early version of the flatbed scanner, angled mirrors feed the image of a document through a series of encoding CCDs. Similarly positioned mirrors are also used in the treatment of amputee victims; the image of an extant limb is projected onto the phantom limb, allowing the patient to engage with this limb's sensory map. Constantly reflecting on this imagery, Andrea Crespo's recent solo show "polymorphoses" at Hester in New York evokes an environment of clinical intimacy in its aesthetic and conceptual coherence. Similar to an LED screen or scanner, the digital prints on the four poly voile curtains covering the windows are backlit by the sun. 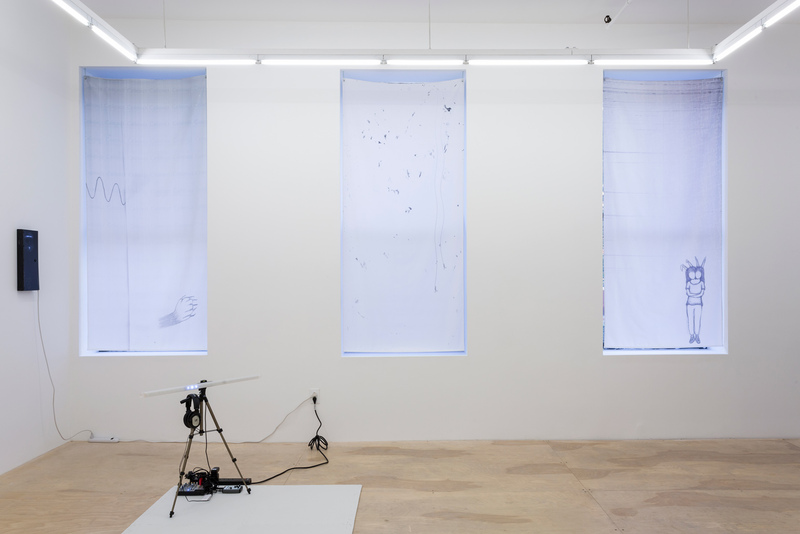 Positioned in front of these curtains, an EMDR light bar (used by cognitive therapists to treat post-traumatic stress disorder) replicates a scanner's mobile light in the sculpture polymist: echolalic transponder; its accompanying soundtrack abstracts the diegetic sound of this light's kinetics as low digital tones. A scanner's white light rhythmically appears, segmenting the film parabiosis: neurolibidinal induction complex 2.2. The film's DeviantArt-sourced images of conjoined anime characters appear in bluish-white on a dark background, recalling the emerging effect of minimal boot-up images; they regularly converge, split, and merge again. The visually spare figuration is combined with minimal diagrams of mitochondrial reproduction, suggestive of the biological processes within technology. Through this parallel between biological and technological encoding and multiplication, the film links the scanner's abstraction of materiality into a system of digital circulation and memetic engineering with the production of DNA. 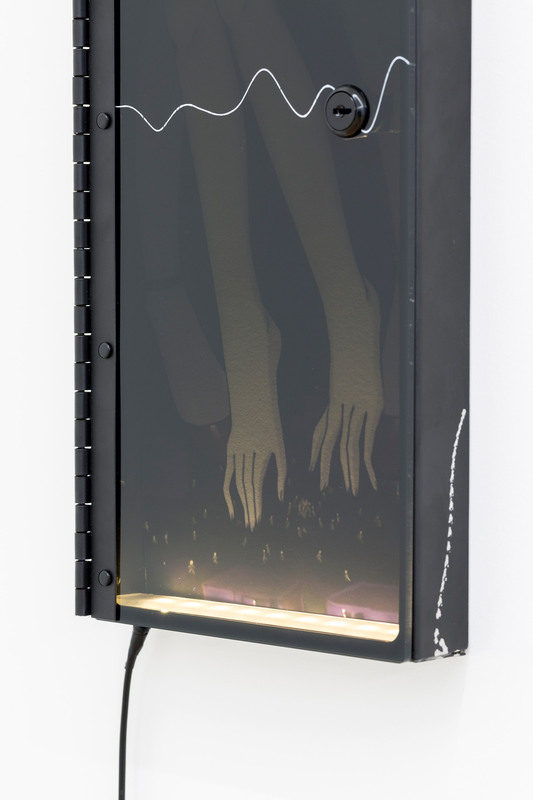 Conjoined figures are considered within the interfaces and hardware in which they are embedded: in the film, they are suggested in a chatroom, cycled through on a Gameboy screen, and presented on a twitchy flatscreen monitor. 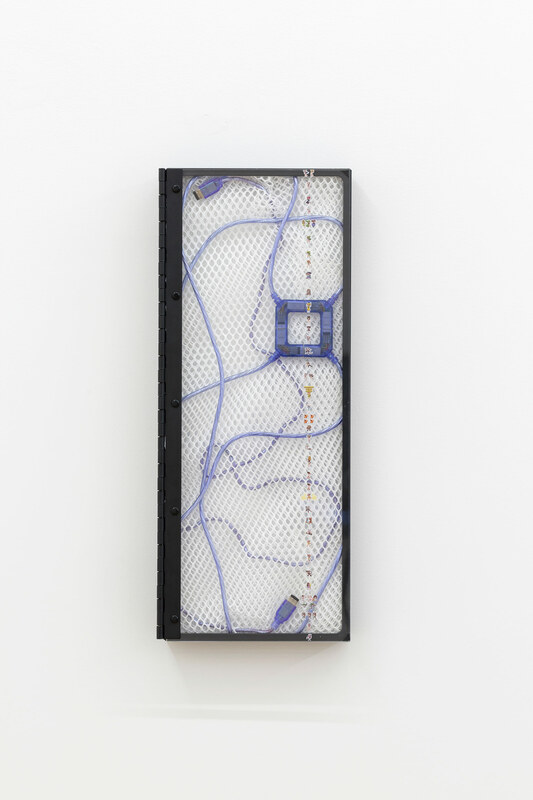 Furthering this intertwinement of hardware apparatuses and the images they circulate and encode, the show's series of data security boxes, cut to protrude two inches from the wall, schematically sequences this bodily association with data. This is done to great effect in plurisim (incubator), in which a four-prong Nintendo Game Link cable is interwoven with a polymesh fabric behind a reflective glass, its surface lined with a column of conjoined stickers designed in the sprite style of early videogame graphics. 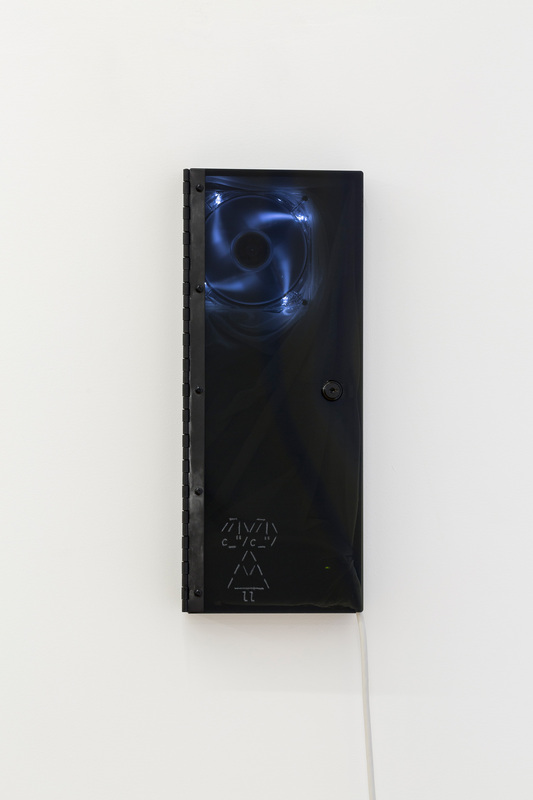 Despite the comparatively shallow immediacy of –--––-––-––––-– (encrypted), a data security box with a key in its lock and a UV-print on reflective darkened glass that recalls the smears, dust, and grease that form a scanner's white noise, the piece's necessity within the series becomes apparent in the works somatospasm (disinterface) and teratosyzygy (host). The UV print in the former depicts hands in the midst of grasping or releasing this detritus over a soft-focused digital print of a linen-like fabric. 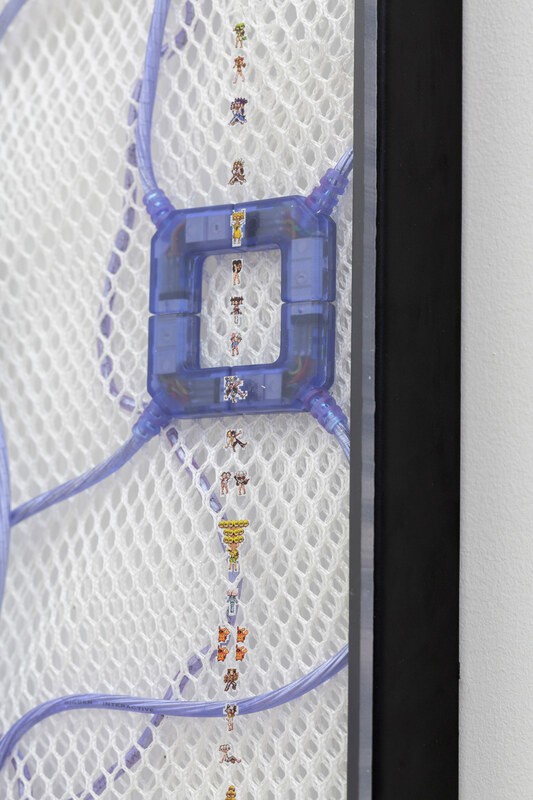 In the latter, the LED lighting of a computer cooling fan only partially illuminates a mesh fabric and a minimal, white etching of a conjoined figure. Fittingly, getting close enough to observe the minutiae of these works often involves avoiding one's own reflection. As well as subtly referring to the imagery's use by Autism Awareness groups, puzzle pieces, appearing in the foam tiles of the seating mat for polymist and as vinyl decals on the scanners in the works s-curves (plasticities) and mobility slopes (long-tails 2.2), echo a type of cloud-based, memetic consciousness implied in Crespo's curation of DeviantArt. Because this type of unpaid content-production is vital to online communities such as DeviantArt and Wikipedia, these conjoined anime characters, in turn, convey a certain malleability of the self that is made necessary by the biopolitics of an information-driven economy. This curation does not simply consider DeviantArt as a theater for wish-fulfillment. Rather, it becomes indicative of how technology encodes the image of the body.